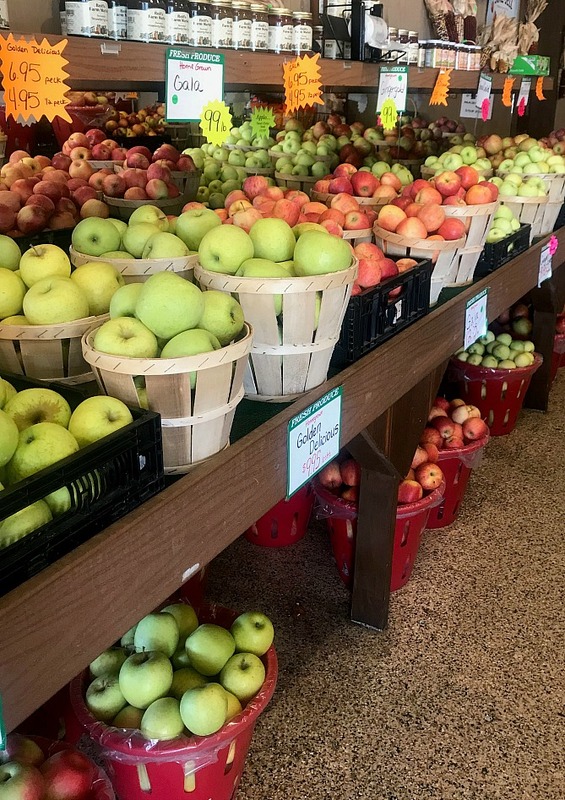 It’s apple harvest time here in Pennsylvania and the local orchards have an abundance of apples in so many varieties to choose from! My mother always made homemade applesauce and I remember her spending hours peeling those apples by hand. It was definitely an all day job and sometimes lasted more than one day! It’s for that reason that I very rarely made my own homemade applesauce when my boys were young. They did love applesauce, still do; but I just picked some up from the grocery store. But, applesauce from the grocery store just doesn’t compare to the goodness of homemade applesauce! *This post contains affiliate links for your convenience. Please see my full disclosure statement HERE. 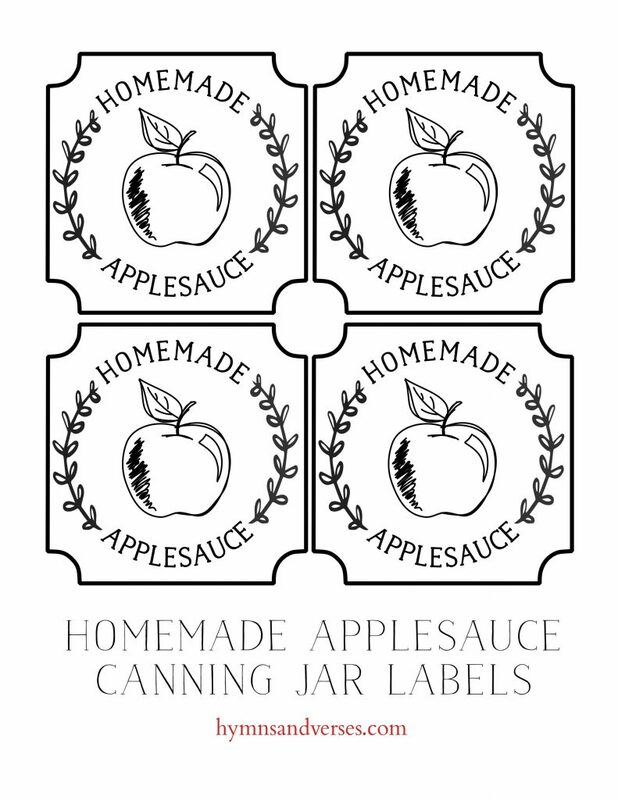 A few years ago my friend, Cindy, had me over one day when she was canning applesauce. She told me that she used her Kitchenaid stand mixer with an attachment to make the applesauce and that you didn’t have to peel or core the apples! What???? I was amazed that day to see how these attachments for the Kitchenaid mixer made the process so quick and easy! And, wouldn’t you know it, my sweet friend gifted me with the attachments for my mixer on my birthday later that year! So many people have a Kitchenaid stand mixer in their kitchen and aren’t really using it to it’s fullest potential! There are some amazing attachments that make the Kitchenaid mixer a workhorse in your kitchen! If you don’t already own a Kitchenaid mixer, you should! I love mine and we use it so often! This is something that is made to last a lifetime and be passed on! The quality is exceptional. This is the model and color of my Kitchenaid mixer. 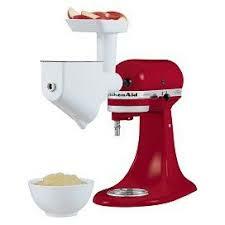 I love the empire red color, but can you believe there are 50+ colors to choose from on the Kitchenaid website!!! Then, you will need the Food Grinder Attachment and the Fruit Strainer Attachment. You can get these attachments together in one set for $73.97 by following the link below. Turning those mushy apples into delicious sauce is so simple with these attachments. You spoon the cooked, mushy apples into the top of the food grinder attachment. There is a tool included (that I’m using in the photo below) that you use to push the apples down the hole to the food grinder. There the machine works it’s magic! The good parts of the apple are strained and the machine separates the seeds, peel, stems, and core and pushes that out the front hole. I set my mixer up so that the bad parts fall right into my sink and then I can wash them down my garbage disposal when I’m finished! Here’s a little video clip of the process. I’m sorry you can’t see what my hands are doing (adding the apples to the top of the grinder), because I filmed the clip in portrait mode instead of landscape – ugh!!! I flipped the video so you didn’t have to turn your head to the side to watch it, but that cut the top and bottom off the frame! So frustrating!!! For this batch of applesauce I used Cortland apples and, since the peels are red, you get pink applesauce! I only bought a peck of the Cortland apples and that made about 3 1/2 quart jars of applesauce. I also made some applesauce using Smokehouse apples. 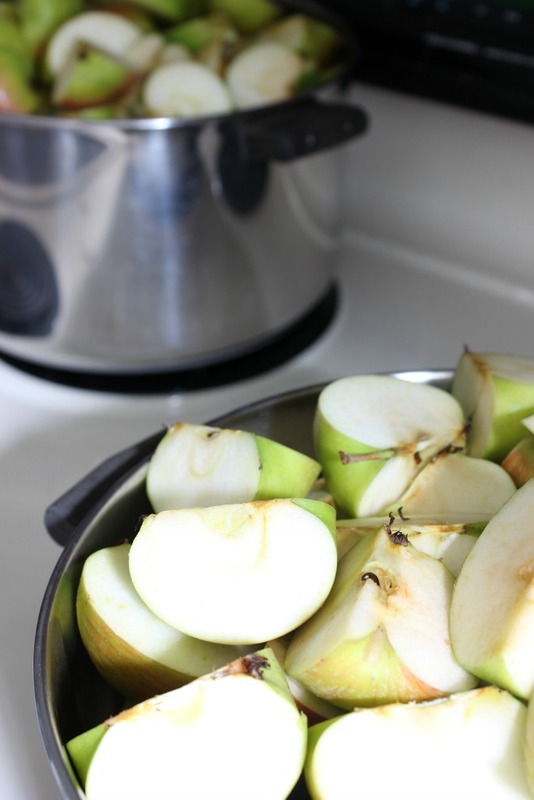 I bought a full bushel of the Smokehouse apples and they filled two large pots on my stovetop (see photo above). Once the apples were cooked down, it took a matter of minutes to have the applesauce finished and ready to put into jars and can! You could also freeze the finished applesauce. I like to can instead of freezing because we don’t have an extra freezer. Plus, I want to use some of my applesauce as gifts for Thanksgiving. 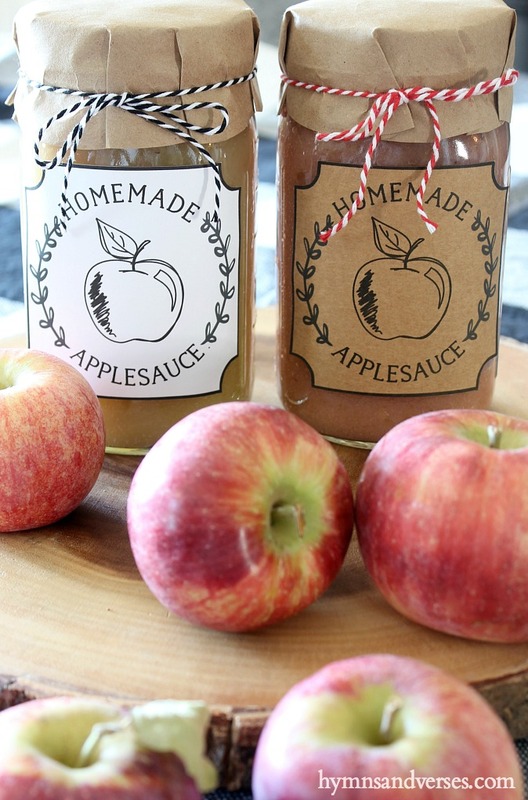 I gave the jars of applesauce some pretty packaging and they’re ready for gifting to my neighbors! I’ve included the printable labels below. I just used double sided tape to attach them. You could purchase label paper and print directly onto that as well. For the lid covers, I just traced around a bowl onto a piece of brown kraft paper and cut out the circle. I placed the kraft paper circle over the lid and folded it down the sides and tied it on with a piece of baker’s twine. I hope this post showed you just how easy it is to make homemade applesauce and that you’ll give it a try!!! Here are some of my favorite fall recipes! My mother made a wonderful dessert with homemade apple sauce. She baked rolled out pie crust cut in about 3×3 squares and put a square then apple sauce and another square and sauce then topped it with whipped cream. She had a little cinnamon in the sauce and it was served warm. I remember my mom making my girls applesauce from their WhitneyCrabapples. It was so good but peeling the tiny apples was so time consuming. This looks like it would be so tasty. I watched the video. Your neighbors are going to love this gift. 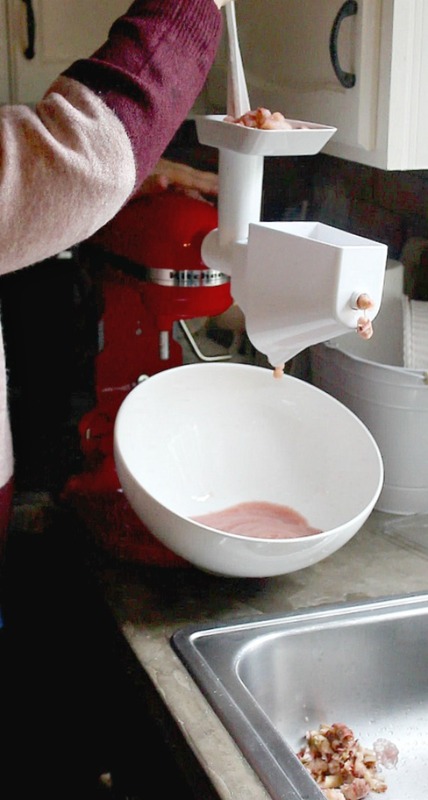 I’ve always wanted this mixer. I bought my each of my girls one and they love it. We may have to have an applesauce party. We have apple orchards about 45 minutes from here where we can get them off the tree. Sounds like a fun idea.